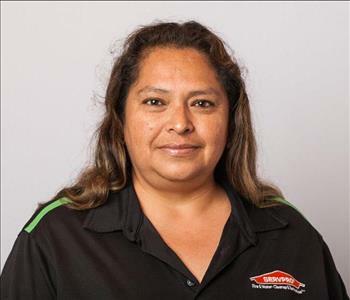 Maria has been in the restoration industry for more than 15 years and has been with SERVPRO of Chico / Lake Almanor since 2011. 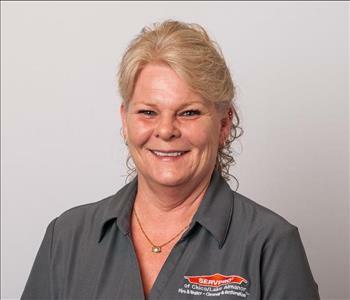 She has worked with or for the owner William Jones for the past 15+ years and is IICRC Certified in fire restoration and ECTP certified in crew production, water production, fire production and carpet and upholstery production. She is an outstanding crew chief, runs all cleaning and content production for our franchise. Maria is always willing and able to respond 24/7 to any loss that SERVPRO receives. Maria enjoys spending time with her family and she volunteers for the American Cancer Society Relay for Life every year to show her support for her community and for SERVPRO! She is bilingual and always available for translation. 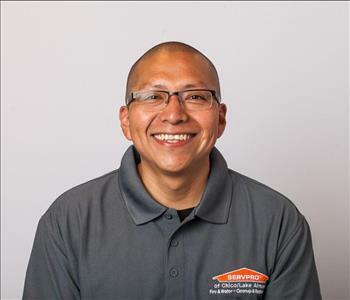 David has been working at SERVPRO of Chico/Lake Almanor since 2014. 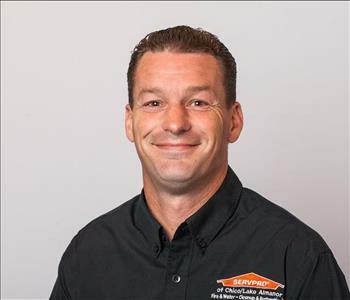 He is ECTP certified in water damage restoration, fire damage restoration, mold remediation, and carpet and upholstery cleaning. David is IICRC Certified in Biohazard Clean-up and Water Damage Restoration. As the Production Superintendent, David is the lead on many restoration projects and he is always compassionate and hard working for our customers. David loves participating in all of the community events that SERVPRO participates in including the Chapman Town Clean-up Day, the Chester 4th of July Parade, the Gold Nugget Days Parade and the SERVPRO Annual Harvest Party! David always makes himself available, day or night, to assist on any restoration projects. 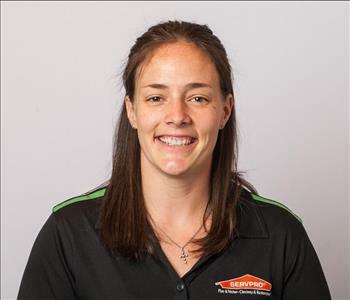 Kelsey has been working at SERVPRO of Chico/Lake Almanor since 2015. Having started out in the Production position, she has a great knowledge of the industry. She also was the Job File Coordinator for a year before moving into the position of Marketing Support Coordinator. Kelsey is now moving back into the production side as the Project Manager. Kelsey is also ECTP certified in water damage restoration, fire damage restoration, mold remediation, and carpet and upholstery cleaning. She has been IICRC Certified in Water for 2 years. Kelsey is knowledgeable with both the Xactimate, Alacrity and MICA programs. Kelsey loves the community and participates in all of the community events that SERVPRO is proud to be involved with including the Gold Nugget Days Parade, the SERVPRO Annual Harvest Party and the Chico Firefighter's Association Adopt-a-Family Delivery Day. Kelsey is CPR Certified and has a certification in Basic Life Support. Katie is our Marketing Manager, and has been with us since July 2015. She has an 12+ year history of volunteer work and community outreach. Prior to SERVPRO, she was in medical field. Her love of helping and connecting with people continues as she shares our vision with our community. Katie isn't afraid to get her hands dirty and work out in the field with the Production Technicians any day of the week. She is always excited and enthusiastic about meeting people of the community. Katie also recently became IICRC Water Certified! 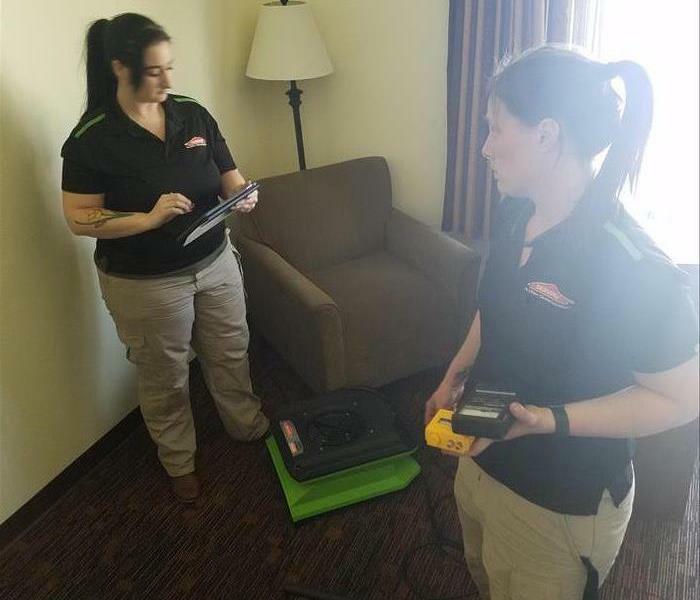 Katie is the head of most of the volunteer events that SERVPRO is proud to participate in including the Chico Firefighters Association Adopt-a-Family, the American Cancer Society Relay for Life, and the NVPOA Expo. 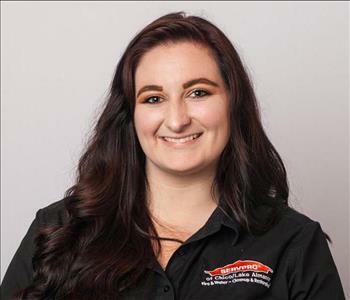 Casey has been a Restoration Technician since 2017 and she has been an excellent resource on all Fire Damages, Janitorial Cleanings, and Content jobs. She is recently beginning to move more into the Water Damage Restoration and the Mold Remediation Services. Casey is ECTP certified in Water Damage, Fire Damage, Mold Remediation and Carpet/Upholstery Cleaning. Casey has recently become IICRC Water Damage Certified. Casey and her daughter love this community and being a part of all of the events that SERVPRO proudly participates in including the American Cancer Society's Relay For Life, the Chester 4th of July Parade and the Gold Nugget Days Parade. Jackie started with SERVPRO as a Job File Coordinator in 2017, and recently moved into the Office Manager position. She has proven to have excellent customer service and telecommunication skills. Jackie is responsible for assisting our customers from the start of the job to the end by communicating with our customers and their insurance company. Jackie is ECTP Certified in Water Damage, Mold Remediation, Fire Damage and Carpet/Upholstery Cleaning, and recently became IICRC certified in Water Damage Restoration. Jackie is currently becoming familiar with Xactimate to be able to assist in our estimating. Jackie is never afraid to work long hours or pick up any additional work. She is a very valued member of our SERVPRO team. 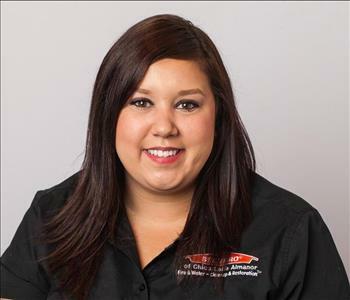 Jessie has been with SERVPRO since 2013. Originally, he started out in the Production Department working and handling jobs for our customers. Jessie recently moved into the Sales & Marketing Representative Role and has proven to be a very knowledgeable source for all of our contacts. Jessie is building strong relationship with several community members including Property Managers, Schools, Business Owners and Insurance Personnel. 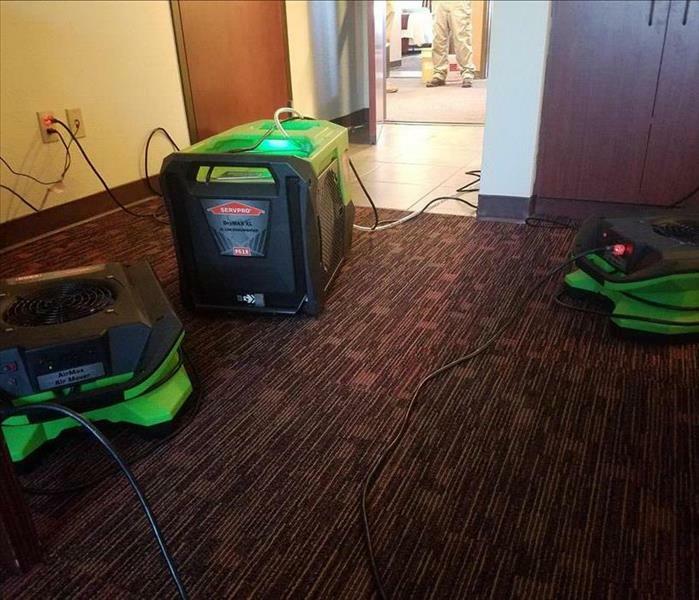 Jessie is IICRC Certified in Water Damage Restoration, Mold Remediation Services and Biohazard Clean-up Services. Jessie is also ECTP Certified in Water Damage, Fire Damage, Mold Remediation and Carpet/Upholstery Cleaning. Jessie has his hands on all of the community events that SERVPRO is proud to be a part of including the NVPOA Expo, the Gold Nugget Days Parade and the Chico Firefighters Association Adopt-a-Family. Jessie is bilingual and is available for translation. Debbie is our Accounting Representative. She has been with us one year. Debbie is an expert in what she does, with over 20 years experience. 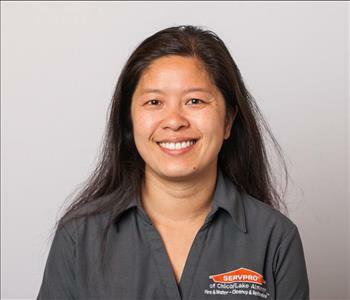 She worked for a tax service as a full charge bookkeeper before coming to us at SERVPRO. Debbie is always willing to help the team out whenever she can. She is happy to stay late to make sure everything runs smoothly for our team. She is such an asset to the company. In her spare time, Debbie enjoys spending time with her family and her dogs.